For many of us, the kids’ going back to school means that summer is coming to an end and pumpkin spice everything is just around the corner. 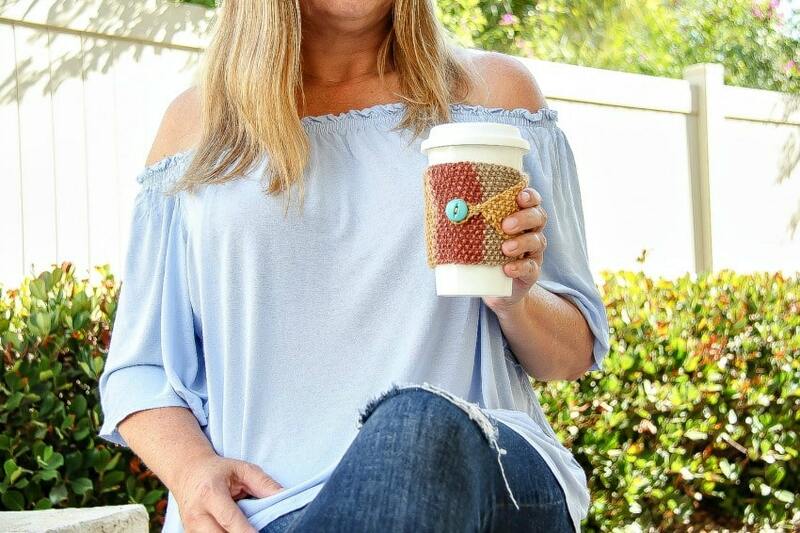 Whether you love hot chocolate, tea, or coffee, you will love this handmade fall knit cozy that you can take everywhere while you are on the go. If you like to knit, you won’t want to miss out on this free knitting pattern, because it creates such a wonderful gift idea! Perfect for teachers, family members, friends, and can even make the perfect stocking stuffer during the holidays. The best part of it all? This can be made while curling up on the sofa while watching a movie. It’s a quick and easy project … you might even want to watch a few extra movies just so you can make these for the whole family. I know that’s what I like to do whenever I come across a free knitting pattern. Super fun! Yarn – I really liked the colors in the Lion Brand Mandala (and it’s machine washable so if you spill a little, you can wash your cozy later). The free knitting pattern you need to learn in order to make this is pretty straightforward and uses just two basic stitches. 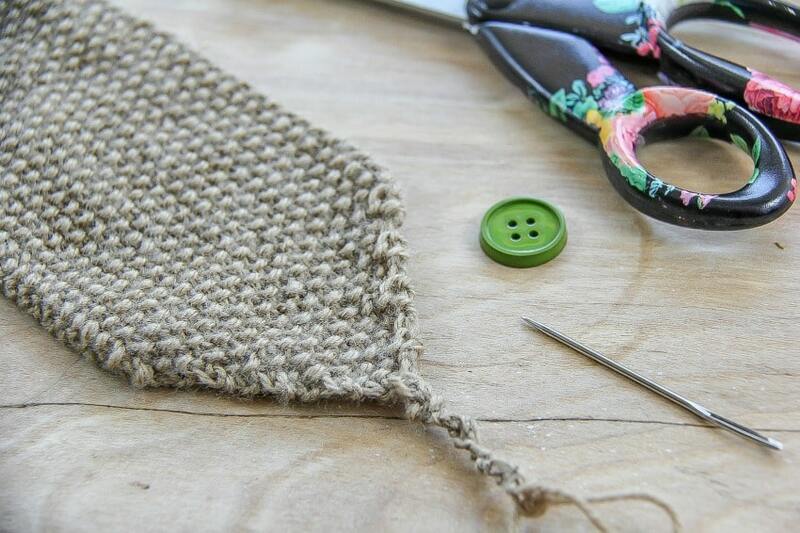 You need to know how to make a knit and purl stitch. 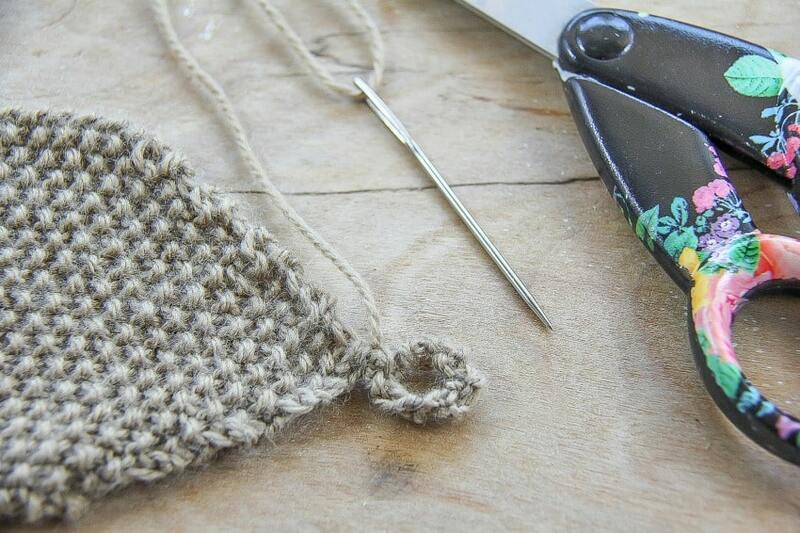 Both will be used in a combination to make a ‘seed stitch’ pattern. 1st row: Knit 1, Purl 1 to end, ending in a Purl stitch. 2nd row: Purl 1, Knit 1 to end, ending in a Knit stitch. Repeat this pattern until your work measures approximately 8 inches long. Your last row will be the 2nd row beginning with a Purl stitch. 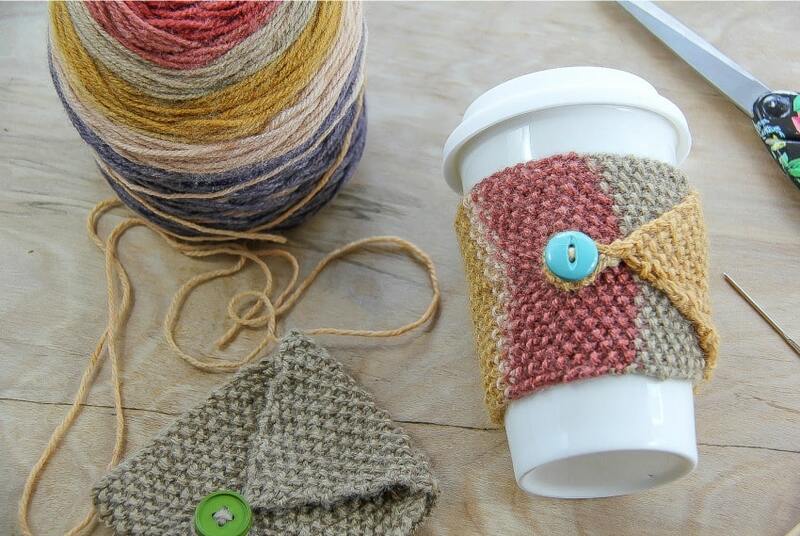 To make sure you’ve got the correct length, wrap it around your favorite travel coffee mug, and if you need to make it longer, go right ahead. Now you will start gradually decreasing stitches until you get down to just two left, this is a little trickier, so follow the knitting pattern below to keep the ‘seed stitch’ pattern flowing. Row 1: Knit 2 together, Knit 1, Purl 1 … repeat Knit 1, Purl 1 until last 2 stitches, then Knit the last 2 together. 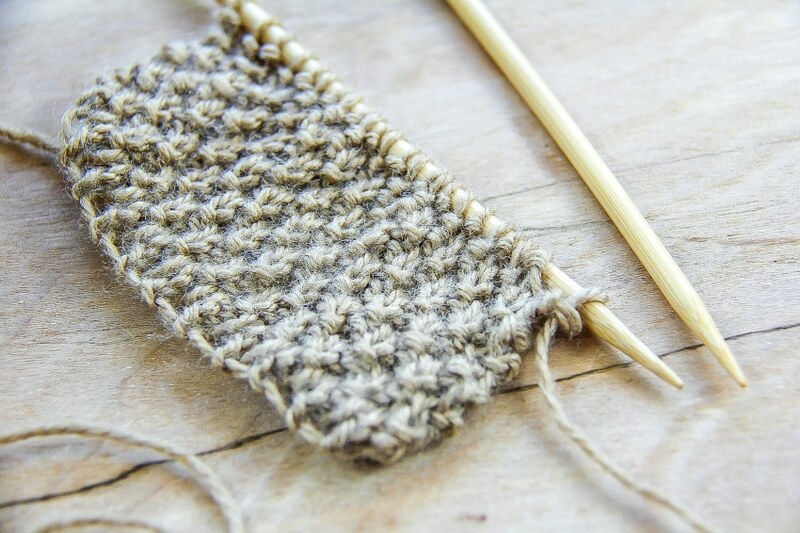 Row 2: Knit 1, Purl 1 … repeat to end, ending with a Purl stitch. Row 3: Purl 2 together, Purl 1, Knit 1 … repeat Purl 1, Knit 1 until last 2 stitches, then Purl the last 2 together. Row 4: Purl 1, Knit 1 … repeat to end, ending with a Knit stitch. Repeat the above four rows in order until you have just four stitches left on the needle, then knit two together twice so only two stitches remain. 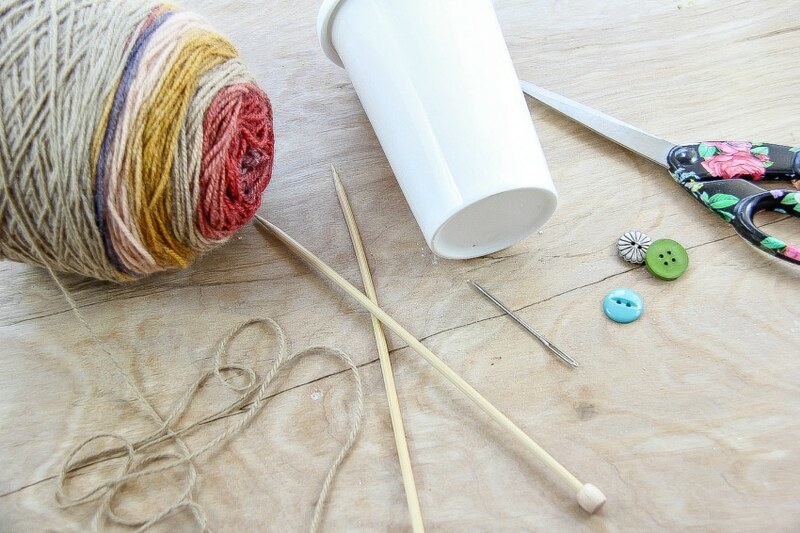 Continue knitting and purling those last two remaining stitches to create a chain, you will make a loop out of this to go around a button, so use your button as a guide as to how long to make your chain, you don’t want your loop to be too loose. 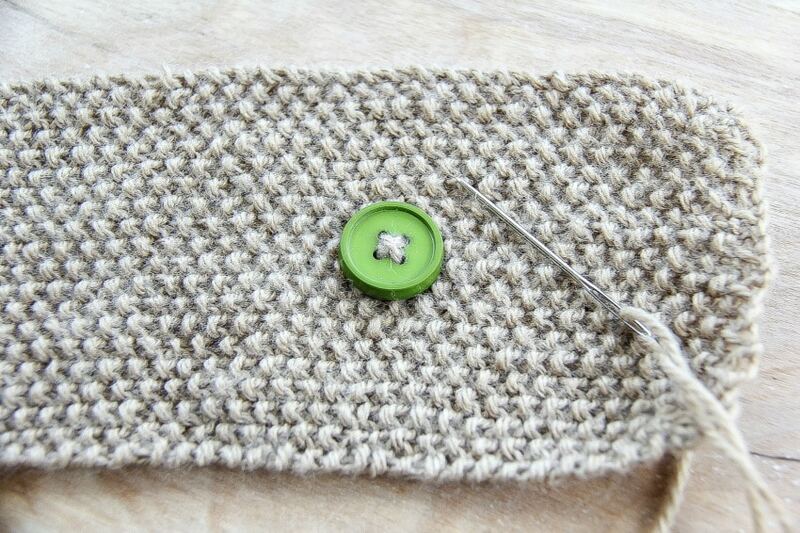 Now, sew on the button using yarn and your needle approximately 2.5 inches from the start of the knitting (not the end where you decreased stitches). You are all done. 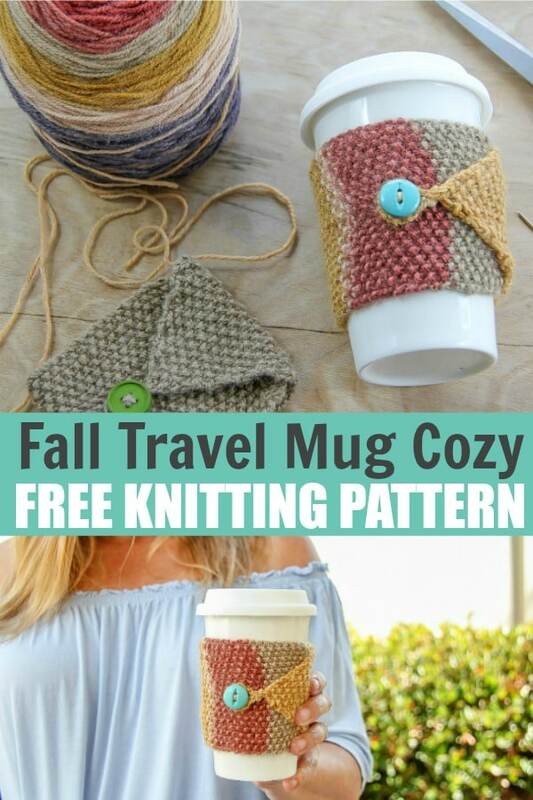 Go wrap your new fall knit cozy around your favorite travel mug.